Whether I continue to add poems to the blog will depend on the quality of work that’s sent to it and my own commitments. Anyone who has ever been involved in running a poetry blog will know the hours taken up by opening emails (God Bless the poets who send poems in the body of an email), reading submissions, corresponding with poets, proofreading, laying out poems in WordPress (never have I felt greater love for poets using regular spacing and line breaks), publishing posts and promoting the blog through social media. I’ve had a fantastic year, I’ve made friends through email, Twitter and Facebook and I’ve bought and read many pamphlets and books because of the work I’ve discovered through my own blog. And Other Poems has also given me backache and headaches (there is a lot of computer time involved) and has eaten into my own reading and writing time (but as the year progressed, I managed this more effectively). Has it all been worth it? Absolutely, YES. The blog has been described as, among other things, “a great resource”, “open-hearted”, a “rattle bag” and a “gathering place for slightly dispossessed poems”. It represents a small selection of, mostly British, poets publishing today, some famous, widely published and seriously lauded, some not so well-known – yet. ..whether or not they’ve been posted on And Other Poems. I’m grateful for your interest in my blog and I’m especially grateful to all readers, likers and sharers – it’s been wonderful to see poems from my blog tweeted and linked across the World Wide Web. As it stands today, And Other Poems is an advertisement-free archive of a selection of contemporary poetry written in English. I hope it continues to be read by anyone interested in poetry. when I had the idea to put my own poems in a quiet, uncluttered on-line space – not poems that I was currently writing but ones that had already been published somewhere or had won or been placed in a competition. 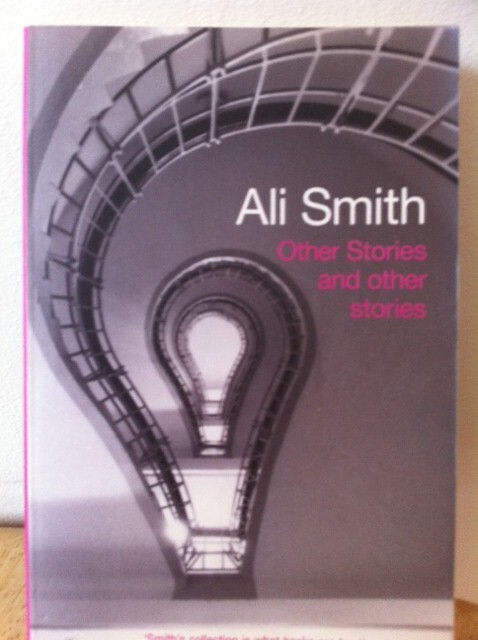 I called the blog And Other Poems, stealing the idea for the name from Ali Smith’s book of short stories, Other Stories and other stories. So I posted my six previously published poems into my blog and within hours had received more views and likes than I’d ever received for my everyday blog (this one). I quickly realised that the blogging community likes poetry – but how to give them more of what they wanted? So I had the idea of contacting writers to ask if they’d like to post poems on my blog. At that time I had perhaps 100 followers on Twitter and a few more contacts on Facebook. I’m a graduate of the MA in Creative Writing at UEA so I do have some contacts in the flesh, as well, but not so many poets since I am a relatively new convert (my MA is in Prose Fiction and until 2009 I’d mainly written fiction and scripts). But I set out contacting the poets in my circle via the internet. No harm in asking, right? I was delighted that, very quickly, poets said yes and started sending me their poems. I clearly set out the concept of my blog, which is that it’s a quiet, uncluttered place for poems and nothing else. Previously published poems are fine, providing the poet owns the copyright, and, if possible, the poems aren’t available to read elsewhere on-line. I wanted to keep the blog simple, with lots of white space for the poems to “breathe”; I didn’t want Twitter and Facebook feeds cluttering the site so I chose a WordPress theme with an area at the foot of the site for widgets (archive, recent posts, etc.). I experimented with a few different themes and layouts before settling on the Twenty Eleven theme. However, now that the blog is one year old, I’m looking to refresh the site with a new theme so there are some changes ahead. I’m giving the Twenty Thirteen theme a try. If the new theme proves to be too distracting or unpopular, I’ll probably change back. I don’t want unhappy customers. It does actually feel, at times, like a shop, arranging the poems in the window and hoping people will pop in. Once I’d contacted poets asking politely for their work, the poems started arriving and the rest is history, really. Before long, poets started contacting me and offering poems for the blog so I added submission details. I began by trying to post a different poem every day, then several each week, then several poems on the same day. Eventually I settled on posting poems on Tuesdays and Fridays – sometimes a single poem, sometimes a short series by the same poet. Some poets choose to send previously published poems, some are out of print, some are new, unpublished poems. 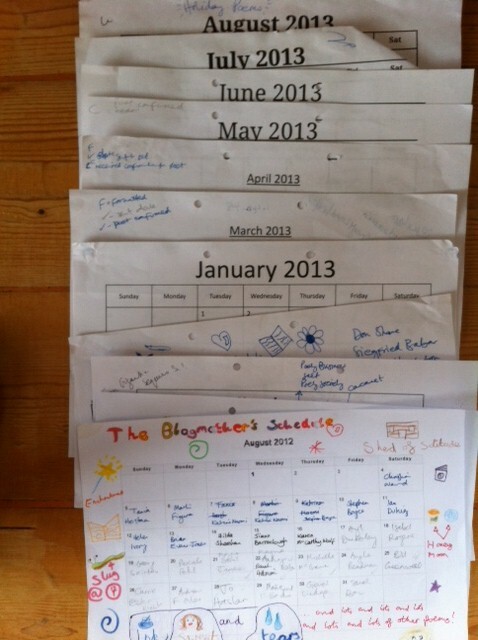 With poems coming in left, right and centre (it certainly felt that way) I had to find a way of organising myself. I printed off blank downloadable calendars from the internet so that I could schedule when I’d post each poem and let the poet know which date their work would be appearing. When I first started posting poems I was a little obsessive, spending hours on the blog to get it right and doing all I could to gather some interesting poems. I was shopping with my daughter, Kitty, who was 13 at the time, when a really great poem came in and I showed it to her on my phone. 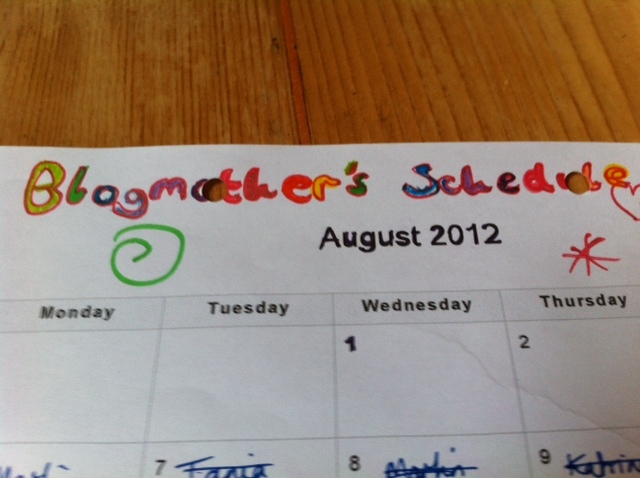 “You’ve turned into The Blogmother!” she quipped and, later, decorated my first schedule accordingly. To this day, it remains my favourite. I keep pestering Kitty to send me one of her poems but so far she hasn’t been tempted. when I ask them for a poem just as I haven’t been able to say yes to everyone who’s sent work. Sometimes poems just don’t fit the blog or are too similar to other work that’s been sent. I always try to respond quickly and I’m always kind (I hope) because I know what sending work out is like. With regard to my own poetry, my rejections far outweigh my acceptances. And in the interests of balance, I’ve left only one of my poems on AOP – perhaps I’ll post more in the future. So there it is, a year of poems. I can’t really think of anything else to say so I’ll leave it to the poems to do the talking. Do pop in to visit them, you won’t need your coat or your wallet. I was lucky enough to be one of the earlier contributors, and it has remained a delight. I can’t believe you’ve been doing this for a year! We are all grateful: a calm, ad-free space online is precious indeed. I’ve found some gems here. Thank you. Thanks for everything, Isabel! I value your friendship across the blogosphere and hope that we’ll meet in person, one day! As you know Josephine, poetry is not my thing so I’m not a regular reader of the poems submitted but I do read all of your posts about your own writing, workshops etc and enjoy following your progress. Well done on sustaining a commitment to your blog as I know how easy it is to let things slip and how much time and effort it takes to make sure it looks professional. Thank you for taking time to produce this really well written summary; interesting, concise, and clear as a bell, all characteristics of your excellent clutter free and user friendly blog, definitely one of the best places online to find poetry. Josephine… I’ve loved your blog and the poems you have featured have often moved me into reading up on the poets and buying their collections and pamphlets, but more importantly, have often just moved me. What a beautiful comment, Lindsay, thank you. Thanks for all your hard work setting up and keeping the blog going. I love discovering new poems & poets, and I feel privileged to have a couple of my own poems up there alongside such fine work. Your quick response is also appreciated! Here’s to another stimulating year, in whatever form. And hope you make time for your own writing too. Thanks again. Congratulations on your first birthday! Any blog has an uncertain life, and finding a niche is the trick, you have found yours in providing both a platform for others’ work and a debating post for poetic issues. I always look forwards to your posts. I’ve enjoyed popping in and reading the hugely varied range you’ve put on here, good work for starting, and for continuing. Thank you, Josephine. Your blog is one of the few ways I can become acquainted with contemporary British poets who have not yet been published in the U.S. It’s a great service to the poetry community. Thank you so much for such a generous comment, Steven! Delighted to be in touch with you. 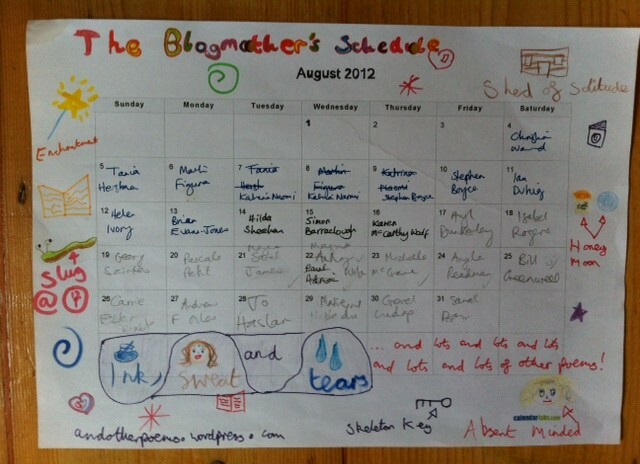 The blogmother. What a great name. I really like the range of poems and poets you are threading together through your blog. Hope it’s not taking up all of your writing time though! Thanks, Sue. So pleased you’re enjoying the blog – mm, time-management is an issue, still striving to get the balance right! Congratulations! Long may you blog. Happy Birthday to *And Other Poems* ! I’ve been following your poetry blog for a few months now, Josephine, and I enjoy it very much. I have just encountered your blog today and am looking forward to dipping into your old posts and reading the yet to be written. I can’t imagine the time it took to review submitted poetry and organizing it to present online. But what a wonderful and necessary tasks for readers and writers alike! Hi Josephine, I am wondering how you deal with the copyright issues of previously unpublished poems on your site. I would like to start a poetry community of my own but I am hesitant to ask poets I know for their poems, since I know they would rather see their work in print or with a more reputable site than my amateur blog. Don’t many magazines not accept “previously published” poetry, including stuff that has appeared on a blog somewhere? Hi Mary, As you have stated, publication on a WordPress site is publication, so writers would need to choose whether or not to publish their work on your site. Copyright would remain with them. Their work would not be eligible for any journal that wanted previously unpublished work. The majority of writers who send work to And Other Poems have already published the poems elsewhere but they appreciate the wide audience reach of the site and the opportunity for their work to be ‘read again’. Best wishes with your project. – Josephine. Thanks for the clear response and wish of luck. Best wishes for the continuing success of And Other Poems!